VOOPOO UFORCE Sub Ohm Tank,Are you curious? Did you see UFO ? Is it amazing? VOOPOO UFORCE Tank will give you a magical experience ! The VOOPOO UFORCE Sub Ohm Tank presents a sensational performance tank with a superior quality chassis design featuring 3.5mL maximum capacity, quick vent channel, triple bottom airflow control, and the UFORCE OCC Coil System. The flagship creation from the manufacturers behind the popular DRAG and VOOPOO TOO series, the UFORCE Tank measures 24.6mm in diameter with elegant lines and grooves for a striking impression. The maximum juice capacity is 3.5mL, accessed via a sliding top-fill mechanism for convenient refills. The quick vent channel is implemented with a shorter chimney section than the standard Sub-Ohm Tank, allowing for rapid discharge of heat while maximizing flavor production. The new UFORCE OCC Coil is made for dynamic performances, featuring a 0.23ohm U4 Quadruple Coil with a wattage range of 50 to 120W and a 0.4ohm U2 Dual Coil with a range of 40 to 80W. Airflow enters the structure through three external airslots located at the bottom base, traveling upwards towards the atomizer chamber for a tremendous cloud delivery. Smoant does make some really nice looking devices. Are you looking for a goodlooking&functionalMod? Today i’ll introduce one . 1.It features a ergonomic classy design with comfortable hand feel. 4.This Modefined Lyra 200W Box Mod equip with Stainless steel 510 atomizer connector. 5.It with the compact size, easy to be carried anywhere. 6.Available in 5 colors for you option. The first bottom feed RDTA in the world coming, it is IJOY Combo Squonk RDTA, that can easily work with the squonk BF Mod. With the postless gold-plated deck, it can compatible with the single and dual coils. Side airflow control with 6 inhale holes, direct to the coils, the IJOY Combo Squonk RDTA brings you cloud vapor and good flavor. Original Aleader Orbit 80W Kit, Low Price! The weekend is coming!Hope you have a nice weekend! power of 80W. As for the Orbit atomizer, it’s with rebuild-able deck and features adjustable airflow. Good weekend !Today some new vape arrival maybe it is what you want. Here’s a heart stopper…the Artery PAL AIO Starter Kit! Inspired by a cardcase, the PAL is thin and portable in your hands. With 3ml liquid capacity and a built-in 1200mAh battery which means you can vape for a really long time. The innovative slide refilling system upgrades the juice filling to a new level! The cover of the PAL is also changeable too (the spare covers are sold separately). Compact yet functional, the Artery PAL will definitely become your VAPING PAL! The Hugo Vapor URUS Mod can be compatible with 18650, 20700, 21700 batteries (not included) and the maximum output can reach 100W. It utilizes Nylonfibre frame, which makes the mod very light-weight for easy carry. The atomizer resistance supported is from 0.06 to 3ohm. With multiple working modes, including VW, Bypass, TC (Ni, Ti, SS), VTC and Preheat, URUS Mod will bring you a lot of fun on vaping. Are You Looking For RDA Atomizer For Squonk Mod ? It is a good day today.How about you ? Here coming a new RDA Atomizer- Hugo Vapor N RDA ,I must share with you !Only $13.99 you can take it away ! The N RDA is a BF RDA with 25mm diameter and adjustable side airflow. It can work well with not only the Hugo Squeezer BF Squonk Mod, but also other squonk mods on the market. The RDA comes with ultem wide bore drip tip. Arctic Dolphin Amber MOD Coming! MOD coming,Which has good-looking color and high-end stabilized wood construction . with a comfortable top fire button. Together with a 510 thread and a 7ml food grade silicone bottle, the Amber will bring you amazing puffs! Today we’ll introduce a latest design kit-Uwell Ironfist Kit. Uwell Ironfist Kit 200W comes with the Ironfist TC Box Mod and Crown 3 Sub Ohm Tank. It features the exclusive single switch that you don’t have to click the fire button 5 times, and it is more simple and safe than other mods. The UWELL Ironfist 200W TC Box Mod is a performance vape mod built for modern demands, deploying a mature yet sophisticated design and high-performance Snakeskin textured leather, feels first-class and gives the ironfist that stylish look. Along with the exclusive single switch design, no need to click the fire button 5 times, simple and safe. Powered by dual 18650 batteries, the Ironfist fires up to a 200W maximum output. 2018,Free Gift Send To You ,Seize The Opportunity! Long time no see , we are back from the Chinese NewYear holiday, miss you so much , did you miss efun.top? Today we have a gift send to you-allthe orderes from Feb28th to Much 2nd , will get a “1 Bag Wick ‘N’ Vape Cotton Bacon V1 For E-Cigarettes” for free . we have the lowest price and all the orderes from 28th Feb to 2ndMuch will get a cotton for free ! please Seize the opportunity join us to get free gift ! 8th Mar Women’s day coming also more discounts coming!Please join us to save more ! Grab the opportunity to save money! Do you know that the latest new products? Here are some that you cant miss . 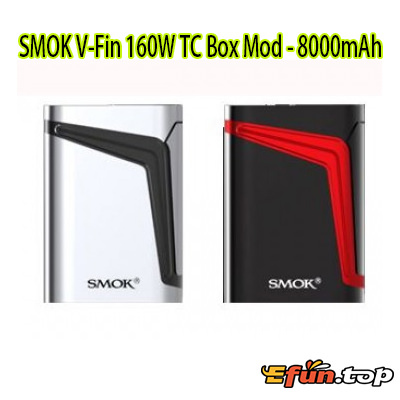 SMOK V-Fin 160W TC Box Mod is an elegant box mod with an unique inlaid pattern, measures 85mm x 56mm x 31.5mm in size. Features powerful internal 8000mAh battery, the V-Fin box Mod delivers a maximum power of 160W, available in TC, VW and Memory Modes for you to choose. Together with big fire key and high-definition OLED screen, the V Fin mod will bring you comfortable hand feel and powerful output wattage. Besides, there are multiple types of protections to safeguard. SMOK Devilkin 225W Box Mod is the incarnation of courage and justice, with ergonomic design with lateral big fire key, comfortable to grip and operate. Works with dual 18650 batteries, the SMOK Devilkin Mod delivers a maximum output of 225W, along with three modes avaible to choose, including VW mode, TC mode(Ti, Ni, SS) and Memory mode. This mod adopts curve design, upgraded UI interface for better using experience. This SMOK Devilkin Box Mod is perfectly pair with TFV12 Prince tank, which will bring you ultimate vaping experience. one more import thing all the new items with code “NP5D” get 5% off . @Mark_Turner has @andycolins gotten back with you? I am not sure how I would feel if he just totally ignored you. I for one won’t be purchasing anything from Efun.top until they take care of their responsibilities. I sent a message 2 weeks ago to @andycolins to no avail - I have since passed it to @daath hopefully the open competition is sorted very soon. I contacted them when @woftam wrote me; I still haven’t heard back from them. I will follow up tomorrow.